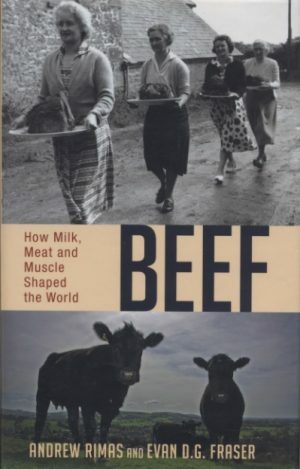 Beef: How Milk, Meat and Muscle Shaped the World by Andrew Rimas and Evan D.G. Fraser. Mainstream Publishing. 250 pp. £12.99. The authors, a freelance journalist with extensive international travel now based in Boston and a lecturer on farming and the environment at the University of Leeds in England, tell the “story of cattle and of the people who made them what they are.” (p.23). 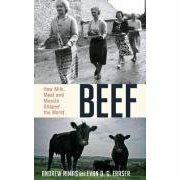 Beef is a collection of creative non-fiction essays arranged in the linear narrative theme of humanity and its development over the ages. So, we start with “From Horn to Hoof” (prehistory to 8000 BC) and end on “The $300 Sirloin” (twentieth and twenty-first centuries). The authors skip anecdotally through the millennia from pre-historic times in Africa and nomadic tribes and their herds of cattle to contemporary Japan and Wagyu raw meat at $300 per pound. This should’ve been a road less travelled as with the passing of each chapter there is a growing sense that what we’re reading is an arbitrary collection of a bit of this and a bit of that. Functioning as some overarching theme connecting us with the dawn of civilisation (read: real men killing cows) and the unknown fate of our futures (the consumer’s choice: “walk the meat aisle with an eye for qualities like provenance, ecological impact and sustainability, or look to canned beans” [p.220]), the authors weave in and out of their narrative account visits to Africa and the Masai. They end up at Nairobi’s Carnivore Restaurant. Vegetarianism, not even a “meat-free” diet of part-time vegetarianism, is a serious consideration for these authors. They reveal their bias with such ill-informed observations as these. Spartan in simplicity, yes, but the result should debauch the staunchest vegan. [referring to a recipe for rib-eye steak] (p. 18). Beef is like one of those cheap but attractive cookbooks that dare you to impulse buy them at the local supermarket checkout. You just know, however, when you get home there won’t be a recipe worth trying. Indeed, Beef does include recipes, well, what are called “Culinary Interludes.” But who’s going to want them in the age of cancer and heart disease, saturated fat and E. coli outbreaks, factory farming and mad cow disease and water wars and global warming?